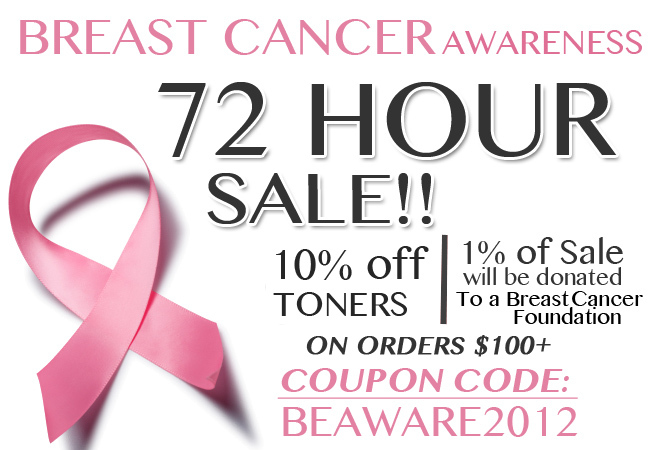 Breast Cancer Awareness 72 Hour Sale | TonerGreen - Eco-Friendly Toners from the U.S.
TonerGreen, an environment-conscious printer supplies retailer, which aims to aims to be the leader in providing environmentally responsible printing solutions, is supporting the Breast Cancer Awareness Month by offering the Breast Cancer Awareness 72 Hour Sale to all its shoppers. 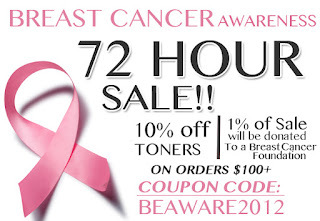 The Breast Cancer Awareness 72 Hour Sale gives all customers the chance to have a 10% discount on all our remanufactured ink and toner cartridges for the next 72 hours (3 days). One can take advantage of this discount by typing in or pasting the coupon code "BEAWARE2012" in the designated coupon box located at the checkout page. As always, orders $50 and up qualify for free shipping. The Breast Cancer Awareness 72 Hour Sale Promo is not valid on any OEM products and cannot be combined with any other coupon codes. 1% of total sale will be donated to a Breast Cancer Foundation. This is one of TonerGreen's ways of showing support to the international health campaign of spreading awareness to this global disease that had been causing such suffer and distress to the lives of the people you may know and may not know of. Right now, NBCAM Organization forms a collaboration of national public organizations, professional medical associations, and government agencies that works together in promoting breast cancer awareness to the public. The NBCAM Organizations includes associations and organizations like American Cancer Society (ACS), American College of Obstetricians and Gynecologists (ACOG), American College of Radiology (ACR), The American Society of Clinical Oncology (ASCO), The American Medical Women's Association (AMWA), AstraZeneca HealthCare Foundation, CancerCare, Men Against Breast Cancer (MABC), National Medical Association (NMA), The Oncology Nursing Society (ONS), Prevent Cancer Foundation, Susan G. Komen for the Cure® and Y-ME (formerly known as Breast Cancer Network of Strength®). Presently, there are no specific cure found that can permanently provide a solution to cancer aside from chemotheraphy, stem cell treatments, radiology treatments and surgery. For now, the best remedy most people can point is "prevention". And that's what the Breast Cancer Awareness Month campaigns for, to share people the knowledge about the disease and decrease the statistics. For more information, you can visit NBCAM Official Website.